We all know the tragic ending to Thurman Munson's life in 1979. But to truly understand the magnitude of the impact he left on the Yankees community, baseball, and all New York sports teams, you've got to find yourself a seat at the annual charity dinner created in his honor. And that's where I found myself last night: at the 37th Thurman Munson Awards dinner along with fellow New York sports bloggers and beat reporters, all organized by Thurman's widow, Diana. The awards are presented for success and inspiration on the fields of play and community spirit off the field. 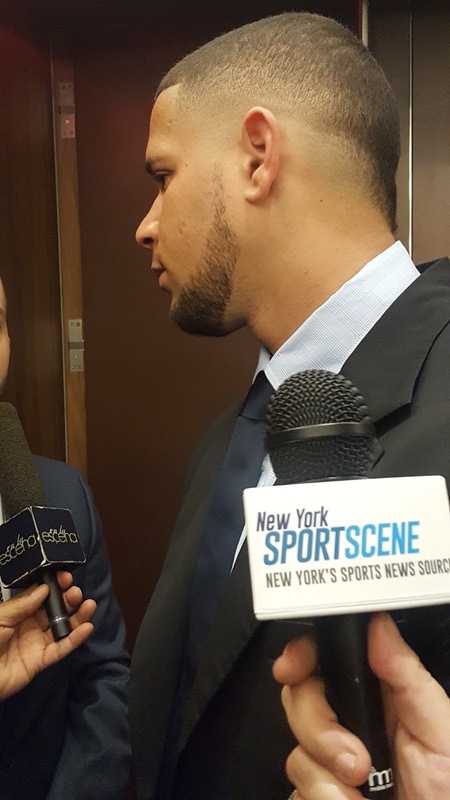 This year's recipients included Victor Cruz, Wilmer Flores, and Gary Sanchez. Sanchez made a bit of news in the pre-dinner press conference by officially declaring he would not participate in the World Baseball Classic. 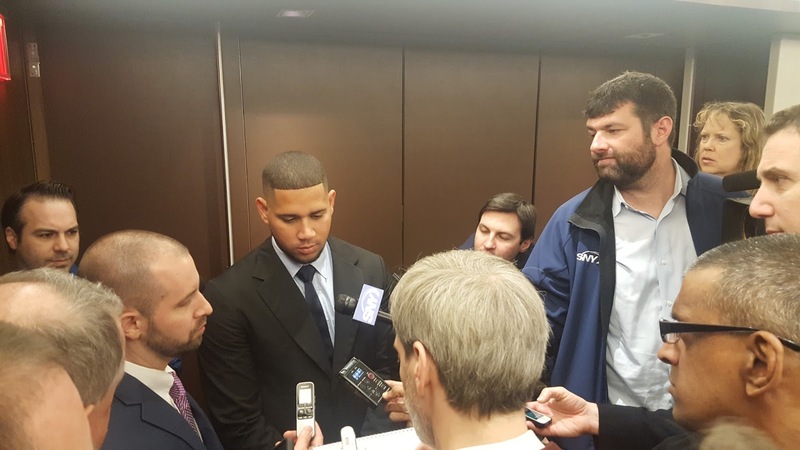 Gary Sanchez answers questions from a mob of media. "I actually said yes initially," Sanchez said through his interpreter. "This last week, I spoke to my family, and the more I thought about it the more I felt I had to be in spring training for the full spring training to get ready for the season." Sanchez, who showed up to the dinner with a beard that Mr. Steinbrenner would not be so fond of, shied away from the idea of being the new face of the franchise. Still, it was hard not to draw comparisons of him to Munson, so I asked a couple of Munson's teammates what they thought about last year's rookie sensation. Bucky Dent said, "Gary's got a bright future. Thurman was our captain, our leader, just a great catcher, great player. Gary has that ability to go on and do the same thing." And Graig Nettles added, "Well, I don't know about being a captain, but if he keeps doing what he's doing he's gonna have a long career." 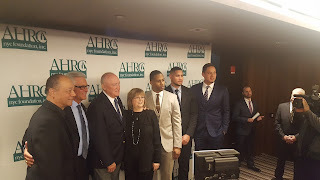 From left to right: Roy White, Bucky Dent, Graig Nettles, Diana Munson, Victor Cruz, Gary Sanchez, and Wilmer Flores. Dent and Nettles were honored at the dinner and were introduced by Diana and Michael Kay, respectively. Over the years this annual dinner has raised nearly $15 million for the AHRC New York City Foundation, which aids children and adults who have intellectual and development disabilities. All in all, it was a very classy evening filled with one moving speech after another. Read on for more nuggets from the honorees and about Thurman's legacy. "I've actually always been a slow starter. I am approaching this spring training with a lot of intensity and I'm not resting on my laurels after the two months that I had last season." He's shaving his beard today and then flying down Tampa. "I was only up for two months, so there's still a lot to learn from catching those guys on a more regular basis. And I think we'll be able to help each out during the season." "His toughness as a player and the way he played the game. He made everyone else pick up their game because of the way he played. He would always say things to you to get you motivated." "He played every day whether he was hurt or not. He was our leader."